What makes a spot qualify as a Wonder? Not just beauty or history or size – it must induce a certain giddy glee at the sheer audacity and over-reaching achievement that makes you want to laugh with pleasure. The Great Wall made me feel like this. So did the Taj Mahal, and Chichen Itza. So did the Katmandu Valley’s Bhaktapur. 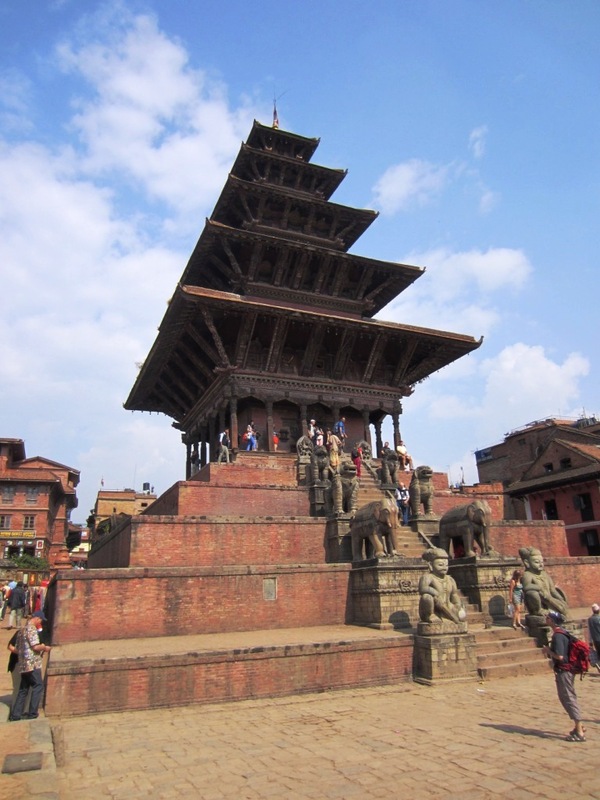 Maybe you, like me, had never heard of Bhaktapur, much less seen a picture. Here is the Nayatopola Temple which so impressed me. This temple is the tallest in the Kathmandu Valley, and in my eyes the most beautiful and interesting. The guardians on the five plinths are carefully selected: the first level shows two legendary champion wrestlers, the most powerful humans in Nepali lore. Above them, ten times more powerful, are two elephants. Above them, and again ten times more powerful, two royal lions. Above them, again ten times more powerful, two griffons from Nepali myth. And representing the final level of guardian power, two goddesses. Inside the temple is an image of Durga, the blood-thirsty avatar of Parvati, Vishnu’s consort. Only priests are allowed inside. The temple rises five stories tall, each roof seeming about to take wing. The final spire points the way to heaven. I can’t stop thinking about the concept of the levels of power, and the thinking that enabled this representation of Man’s humble place in the universal order in such a masterfully graphic way. Not only does it take my imagination from the human to the divine, but leaves five more orders of power and divinity which are invisible and unknowable, beyond our ability to conceive. I can’t think of a better monument to the limitations of our knowledge of God.